Nite Owl Creates: Valentine Pinterest Party Announcement! 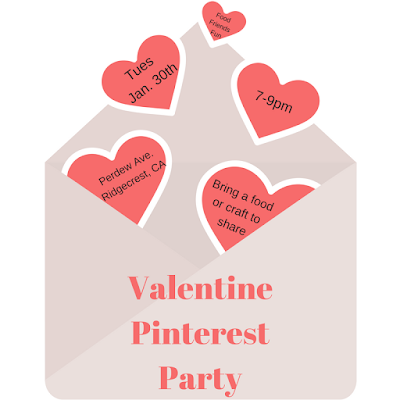 I am super excited to announce the first Pinterest party for 2018! I gotta say first, I am so sad I can't host one in Utah but I plan to do some when I am up there later this year, so don't worry if you live in Utah and are reading this. Valentine's Day is the theme. Maybe you dont have a significant other but no worries! We are going to do crafts (at least the 2 I am planning on people making) that you can give to kids, friends, a neighbor...it doesnt have to be a spouse that you show your love to. Heck, I love the idea of celebrating 'galentines day' where you celebrate the love you have for your friends. Here is the link to the board I created with ideas and inspiration that people can use if they'd like. Here is the link to the event I created on Facebook. FYI to anyone reading this who is planning on coming... I have 7 people confirmed + 1 who is not on Facebook. 2 spots left! If you are still reading and want to see the crafts I've picked for everyone to make, here's a link to one and here's a link to the other one. The second link, I will do a version of that that is a little bit different but similar. I am undecided on the food but am hoping to do one sweet and one more savory. AND! I have a surprise, hoping that most people coming will have Snapchat so...we'll see how that works out. I know one friend coming has it for sure. Can you guess what the surprise I am doing might be? Stay tuned for a post after the party to see how everything turned out!